Stream rehabilitation projects can help protect our streams from pollution and improve habitat both in and along the stream banks. Non-point source pollution such as siltation from eroding banks and increased nitrate levels from fertilizer runoff and livestock negatively impacts wildlife and increases costs to treat drinking water. 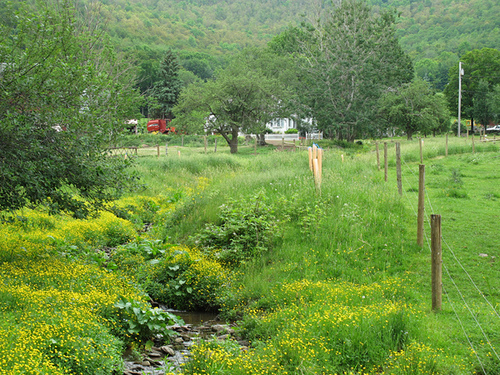 Best management practices such as riparian buffers, stream bank fencing, and agricultural crossings are some solutions to help keep streams protected from non-point source pollution. Habitat structures for fish and other aquatic organisms also helps to support stream ecosystems and wildlife populations. If you own land along a stream that could benefit from some of these projects, contact the Conservation District. There is government funding available for stream rehabilitation for streams meeting required criteria.